Vehicles on the road today are getting smarter, safer and more capable. But even the newest vehicles vary widely in their advanced driver assistance systems (ADAS), which aim to enhance safety and make driving more comfortable. Add to that the global race to fully self-driving vehicles, which will take the driver out of the equation completely. Vehicles can be categorized according to the ADAS features they offer, and the Society of Automotive Engineers defines six levels of automotive automation, explained here. Level 0: No Automation — Zero autonomy; the driver performs all the driving, but the vehicle can aid with blind spot detection, forward collision warnings and lane departure warnings. Level 1: Driver Assistance — The vehicle may have some active driving assist features, but the driver is still in charge. Such assist features available in today's vehicles include adaptive cruise control, automatic emergency braking and lane keeping. Level 2: Partial Automation — The driver still must be alert and monitor the environment at all times, but driving assist features that control acceleration, braking and steering may work together in unison so the driver does not need to provide any input in certain situations. Such automated functions available today include self-parking and traffic jam assist (stop-and-go traffic driving). 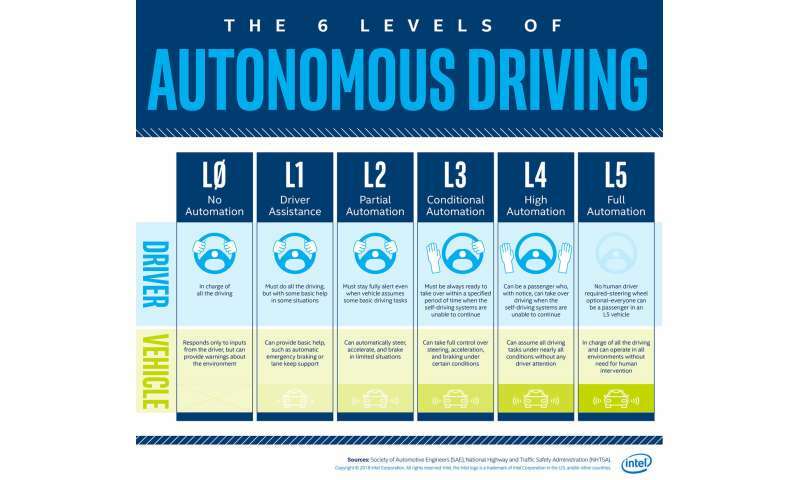 Level 3: Conditional Automation — The vehicle can itself perform all aspects of the driving task under some circumstances, but the human driver must always be ready to take control at all times within a specified notice period. In all other circumstances, the human performs the driving. Level 4: High Automation — This is a self-driving vehicle. But it still has a driver's seat and all the regular controls. Though the vehicle can drive and "see" all on its own, circumstances such as geographic area, road conditions or local laws might require the person in the driver's seat to take over. Level 5: Full Automation — The vehicle is capable of performing all driving functions under all environmental conditions and can operate without humans inside. The human occupants are passengers and need never be involved in driving. A steering wheel is optional in this vehicle.